Texting Underground Can Save Lives And Caves Sixteen-year-old Alexander Kendrick's prize-winning invention combines "teen-tech" with underground communication. 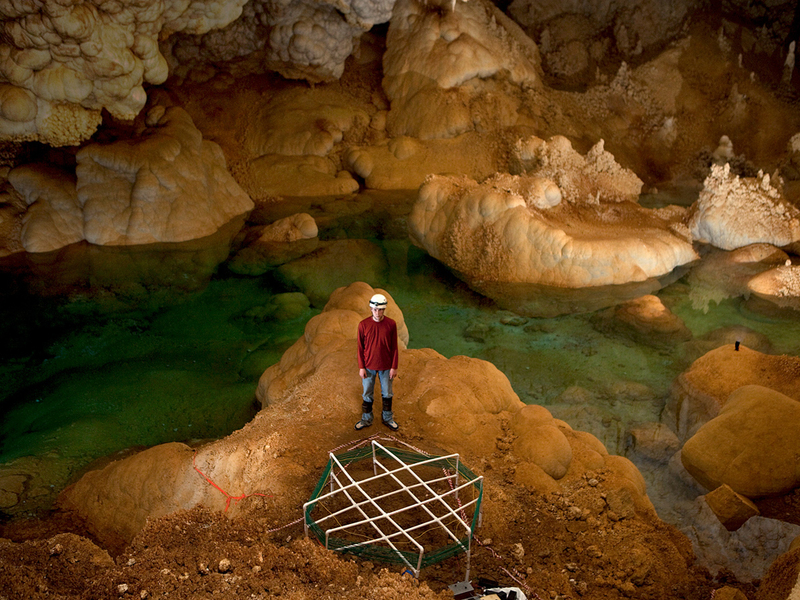 His text messaging device could help rescue stranded cavers and preserve sensitive cave environments. Caves are some of the last places on the planet left to explore. Though caving is relatively safe, if something goes wrong deep inside the Earth, a rescue can take days — in part because cell phones and walkie-talkies don't work underground. But a remarkable teenager in New Mexico has invented a device that may significantly speed that process with the ability to text from underground caves. The young man's invention may have other applications, as well. Alexander Kendrick, 16, won the 2009 International Science Fair for inventing this cave-texting device. The award got the teen from Los Alamos, N.M., a new computer, a trip to Switzerland and $12,000. A cave radio that allows you to beam data to the surface rather than visiting it in person can be extremely valuable. It could save the cave. I wanted to find out why this thing was such a big deal. The next thing I knew, I was hanging from a rope in the bowels of the Earth and groaning under my breath. I was with a team of cavers in Carlsbad Caverns National Park in New Mexico, heading 1,000 feet underground to test Kendrick's invention. The device is something like a computer attached to a ham radio. It transmits data using low-frequency radio waves that can penetrate rock more easily than high-frequency transmissions, like those in FM broadcasts. If this test succeeded, it would be the deepest known underground digital communication ever to take place in the United States. Why would anyone want to text from nearly 1,000 feet underground? Here's why: In a 1991 New Mexico cave rescue, it took 170 people four days to save a woman with a broken leg. The rescue team had to lay miles of telephone line in order to stay in touch with the surface. If they'd had Kendrick's radio, the rescue time may have been cut in half. Alexander Kendrick stands in the Lake of the Clouds after testing his invention. He and the team of cavers executed the deepest known digital communication ever to take place in the United States. That could make the difference between life and death. The other reason this thing's a pretty big deal: science. Diana Northup, a microbiologist at the University of New Mexico in Albuquerque, says cave scientists find microorganisms in these deep caves that might have the potential to kill superbugs. "Microorganisms that live in such a low-nutrient environment actually put out antibiotics, they produce them," Northup says. But scientists think one of the biggest threats to this emerging source of antibiotics is actually the scientists themselves. In fact, researchers believe the more they visit a cave, the less likely they are to find antibiotics. People contaminate the sensitive cave environment just by being there. Northup thinks that by connecting data recorders to Kendrick's radio, scientists could remotely transmit information about the cave environment. "So a cave radio that allows you to beam data to the surface rather than visiting it in person can be extremely valuable," she says. "It could save the cave." Back in the cave, we arrived at the test spot exactly 946 feet underground. The radio was being set up on the edge of a big pool of blue-green water pocked with stalagmite islands. It was 68 degrees, but incredibly humid. Kendrick and the team pulled pieces of white PVC tubing from their backpacks and assembled the radio's antenna, which looks like a 6-foot-wide tick-tack-toe frame with wire wrapped around it. Kendrick's dad, Brian, was about to hike to an identical unit sitting directly above us on the surface. They synchronized their watches, and Brian Kendrick and another caver climbed the steep, dusty slope above us. Then we waited. Two hours later, after calibrating the devices, Alexander Kendrick typed the word "happy" on a rubber keyboard and pushed send. Up above on the surface, his father stared at a small screen hoping to see the word. The message "appy" appears. Not the entire word, but good enough. "That's digital data coming through at 950 feet," says Brian. Now Alexander Kendrick has to fine-tune the radio to make it smaller and tougher and easier for rescue crews to get down into caves. That will have to wait, though, because he's busy working on his 2010 science fair project — a device that finds underground rivers by measuring their electromagnetic currents. I don't know what problem he'll solve next, but I hear there's this thing called global warming.